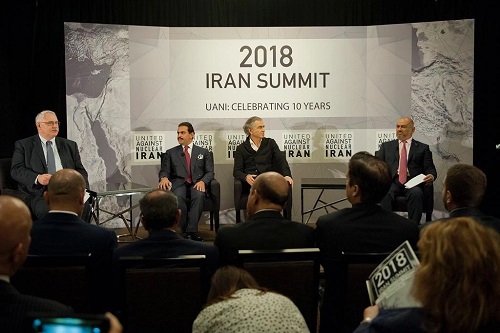 Ambassador of the Kingdom of Bahrain to the United States of America, Shaikh Abdullah bin Rashid Al Khalifa, was present s aa speaker at the important annual event "Iran Summit 2018", held by the "United Against Nuclear Iran UANI", on Tuesday 25th of September 2018, on the sidelines of the seventy-third Session of the United Nations General Assembly UNGA-73 in New York City. Other Key speakers at the summit were the Minister of Foreign Affairs of the Kingdom of Saudi Arabia, Adel Al-Jubeir, Foreign Minister of the Republic of Yemen, Khalid Hussein Al-Yamani and Ambassador of the United Arab Emirates to the United States of America, Yousef Al Otaiba, in the presence of Secretary General of the Gulf Cooperation Council Dr. Abdul Latif Al Zayani. This is in addition to US Secretary of State Mike Pompeo and National Security Advisor, John Bolton, who separately addressed the US Administration's policy towards the Iranian regime. During the event, the Ambassador talked about the reality of the Iranian threat and the Iranian regime's continued attempts to destabilize security by supporting extremist terrorist groups over the past four decades, pointing out that irrefutable evidence confirm such Iranian involvement. He cited Iran’s use of its Revolutionary Guards and propaganda on the one hand, and exporting weapons and explosives, including those made in Iran and used by the Houthis in Yemen on the other hand. In this context, the Ambassador stressed that the Kingdom of Bahrain, thanks to the wise vision of His Majesty King Hamad bin Isa Al Khalifa, has been able to build national mechanisms capable of addressing these Iranian interventions. He also stressed the importance of continued work and cooperation with the allies of the Kingdom, especially the United States of America, to maintain security and stability in the region and confront the increasing Iranian influence. In this regard, the Ambassador praised the American strategy towards the Iranian regime and the decision of the American President to withdraw from the Iranian nuclear agreement, calling on the international community to shoulder responsibility and follow suit of the friendly US Administration. He added that the Middle East is facing five major threats: proliferation of nuclear weapons, ballistic missiles, terrorism, cyber-attacks and disruption of freedom of navigation which the Iranian regime and its network of terrorist organizations are proven to have been behind.